Emirates is no stranger to prestigious awards. The airline is a regular recipient of an incredible array of accolades, such as ‘Airline of the Year’ at the Air Transport Awards, ‘Best International Airline’ at the National Geographic Traveller Awards and ‘Best Inflight Entertainment’ award at the Skytrax World Airline Awards. And now the airline is sharing the glory—and awarding Indus Travels the coveted ‘Agency of the Year’ title. “This is incredible news for the whole Indus Team,” said Praveen Syal, Indus’ managing director. “Emirates only awards this title to a select number of agencies who perform particularly well, so we’re delighted to be named Agency of the Year!”. Emirates flies the world’s biggest fleets of Airbus A380s and Boeing 777s, offering its customers all the comforts of the latest and most efficient wide-body aircraft in the skies. 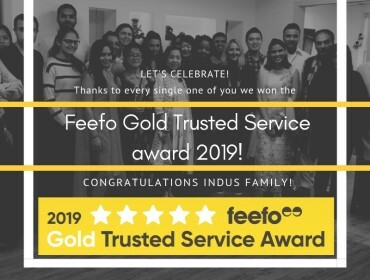 Indus Travels has kicked off 2019 in style with some glittering recognition in Feefo’s Trusted Service Awards. Each year Feefo—which provides businesses with access to technology that allows them to connect directly with their customers—honors its highest-performing clients with a Trusted Service award. Only the very best companies qualify for this prestigious award. The Malaysia Tourism Awards is the highest form of recognition by the Ministry of Tourism and Culture and Tourism Malaysia for industry players whose outstanding contributions have played a significant role in the success of Malaysia's tourism industry. Recognition was given to foreign tour operators who diligently marketed Malaysia to their respective target audience, and members of the media who promoted Malaysia through their publications. "Excellence recognised, excellence rewarded’ is the platform that personifies the concept behind the Malaysia Tourism Awards. Bestowed by the Ministry of Tourism and Culture, the awards represent the pinnacle of achievement in avenues in relation to and in reflection of the Malaysian tourism industry. We are very proud to receive this award for the Best Tour Operator in America. The Israel Ministry of Tourism officially recognized Indus Travels for successfully promoting and selling Israel as a world-class destination at an appreciation dinner at the Fairmont Hotel Vancouver last night. Oded Grofman, consul for tourism, Israel Government Tourist Office (IGTO), Canada, came in from Toronto to hand-deliver an appreciation plaque to Indus’s managing director Praveen Syal. 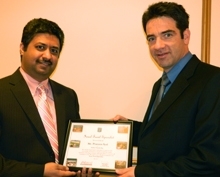 The appreciation plaque names Syal as an Israel travel specialist, and thanks him for promoting and selling the destination. Indus Travels was honored for “Outstanding Achievement in Strategic Partnerships" at one of the tourism industry's most celebrated occasions, the annual South African Tourism's Ubuntu Awards ceremony in New York. The honors were bestowed at the sixth annual Ubuntu Awards at an elegant dinner reception at New York City's Museum of Natural History on Monday, April 13, 2015. 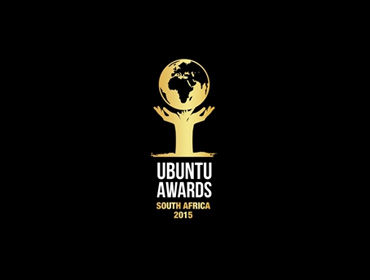 The Ubuntu Awards recognizes South African Tourism's outstanding trade partners in business and leisure travel. The event was hosted by Mr. Thulani Nzima CEO of South African Tourism, Wendy Perrin served as Master of Ceremonies. The Hon. Derek Hanekom, South Africa's Minister of Tourism, delivered the keynote address to distinguished guests including Ambassador Mninwa Mahlangu South Africa's Ambassador to the United States. Trevor North, South-African born, stand up comedian entertained guests at the event. "It is rewarding to be honored by South African Tourism with an award for selling a destination that we are so passionate about," said Praveen Syal, Managing Director of Indus Travels, as he accepted the award. Indus Travels is proud to be the leader in US & Canadian travel to South Africa. Indus Travels offer both affordable small groups and custom trips to South Africa. 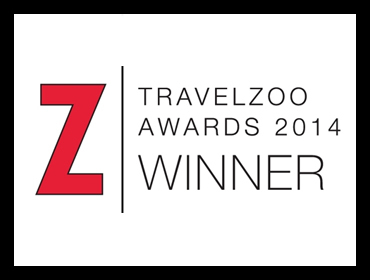 NEW YORK, February 17, 2015 – Travelzoo Inc. (NASDAQ: TZOO), a global Internet media company, today announced the winners of the 2014 Travelzoo Awards. The annual awards shine a spotlight on companies that provide the year’s very best travel and entertainment deals. The 2014 Travelzoo Award winners include well-known brands such as Atlantis, Cirque du Soleil, Qatar Airways, Tourism Ireland, Starwood Hotels & Resorts and outstanding local brands such as the Waldorf Astoria Berlin, the Vancouver Film Festival and the Ascot Racecourse. Travelzoo Deal Experts select the award winners, using a five-point evaluation system that takes into account the quality, reliability, consistency, competitiveness and broad appeal. Winners in the Excellence Award category must also receive a positive rating from 95% of Travelzoo members who experienced a deal with the company. For more information about the 2014 Travelzoo Awards, please visit www.travelzoo.com/tzoos. Indus Travels well known in the industry throughout North America as the premier tour operator to India, has been officially acknowledged yet again as "The Best Tour Operator To India From The Americas" for the fourth time in a span of last five years by the Ministry of Tourism, India. 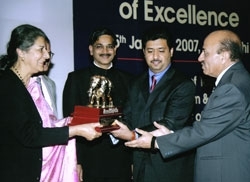 The award was presented in New Delhi, India by Mrs. Pratibha Patil, President of India to Mr. Praveen Syal, Managing Director of Indus Travels on the 29th February, 2012. 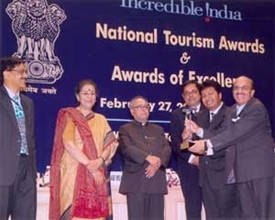 Mr. Subodh Kant Sahay, Tourism Minister, India, singled out Indus Travels at the ceremony for their unprecedented accomplishment as the fourth time winner of the most distinguished award as he congratulated Mr. Syal at the ceremony. 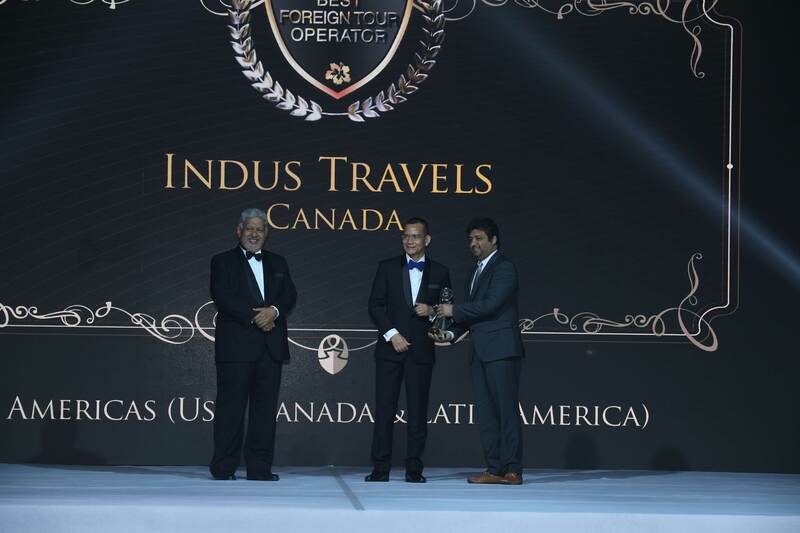 Indus Travels, the Richmond BC based premier tour operator to India, has been acknowledged as “The Best Tour Operator To India From The Americas” for the third time in a span of last four years. 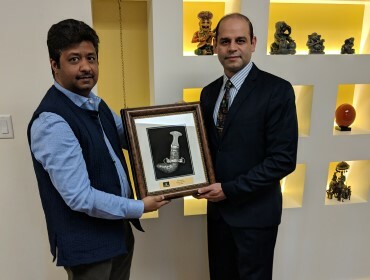 The award was presented by Shri Mohammad Hamid Ansari, Vice President of India to Mr. Praveen Syal, Managing Director of Indus Travels on the 3rd of March in New Delhi. Hon. Kumari Selja, Tourism Minister, India, singled out Indus Travels at the ceremony for their unprecedented accomplishment as the third time winner of the most distinguished award as she congratulated Mr. Syal at the ceremony. When asked to comment, Mr. Syal acknowledged the dedicated staff of Indus Travels and all his industry partners saying, “Without the support of my core industry partners, India Tourism, Canada and the Indus team, this award would not be possible. Indus Travels will continue to be innovative, progressive and dedicated to their commitment to promote tourism to India”. Indus Travels Receives TOP AGENT AWARD from Singapore Airlines. Indus Travels has been honored by Singapore Airlines as TOP AGENT for 2006-07, for the Essence of India program. The award was presented to appreciate Indus Travel’s remarkable track record for quality and reliability for tours to Indian subcontinent. Indus Travels Inc. has been crafting private Custom Journeys and Small Group Trips to India, Nepal, and numerous exotic destinations since 2001. Their regional expertise also makes Indus Travels the operator of choice for dozens of Canada & America’s travel agents. Indus Travels has been again named India’s “Best Tour Operator from the Americas” by India’s Ministry of Tourism. This is the second time in a row that Indus Travels has now won the award. 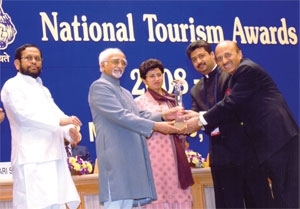 The National Tourism Awards Ceremony was held in New Delhi on February 27, 2008 and the Minister of Tourism, Mrs. Ambika Soni, presented the award to Mr. Syal, the Director of Indus Travels. While uniquely specializing in India, Indus Travels has been able to maximize interest in India by offering a unique combination of tours and unparalleled expertise. Appealing to a wide variety of clients, Indus Travels has successfully been able to send a wide range of travelers to experience the India, whatever their needs and expectations. Setting themselves apart from other North American operators, Indus Travels offers unrivaled knowledge of India from their authoritative team of travel experts and excellent support from their Indian offices. Indus Travels specializes in small group and custom private tours to India and other exotic destinations worldwide, at competitive prices that represent exceptionally good value. In September 2007, the Malaysia Tourism Board presented us with an appreciation award for our exciting repertoire of packages to Malaysia. 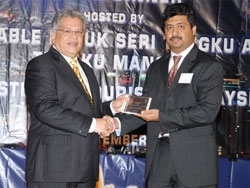 Indus Travels is truly honored to receive this award from the Malaysia Tourism Board. 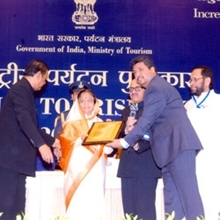 The much coveted Golden Elephant Mr. Praveen Syal, MD, Indus Travels receiving the award from Ms. Ambika Soni, Minister of Tourism, Govt. Of India.